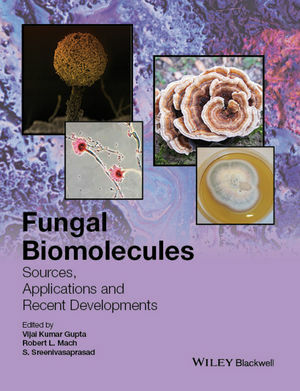 employ fungal products, with fungal biomolecules currently used in a wide range of applications, ranging from drug development to food technology and agricultural biotechnology. Understanding the biology of different fungi in diverse ecosystems, as well as their biotropic interactions with other microorganisms, animals and plants, is essential to underpin effective and innovative technological developments. working in the area of fungal biology and associated biomolecules for their applications in food technology, microbial and biochemical process, biotechnology, natural products, drug development and agriculture. Dr Vijai Kumar Gupta is Lead Researcher of the Molecular Glyobiotechnology Group, Department of Biochemistry, at the National University of Ireland, Galway, Ireland. S. Sreenivasaprasad is Chair Professor of Environmental Sciences and Director of the Institute of Biomedical and Environmental Science and Technology (iBEST) at the University of Bedfordshire, UK. Robert L. Mach is Professor of Molecular Biology, Vice-Head of the Research Division of Gene Technology and Applied Biochemistry, and Head of the Research Group Gene Technology at the Vienna University of Technology, Austria.